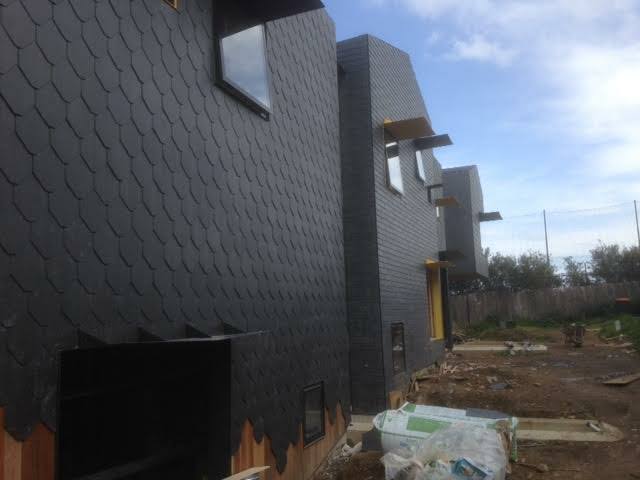 With the strong winds and torrential type rainfall that Melbourne seems to be experiencing in the last few years, it’s increasingly important that your home doesn’t have any damaged slate roofing. If there is, you can be sure it’s only a matter of time before that damage can cause lots of internal problems to plaster, paint and floor coverings. 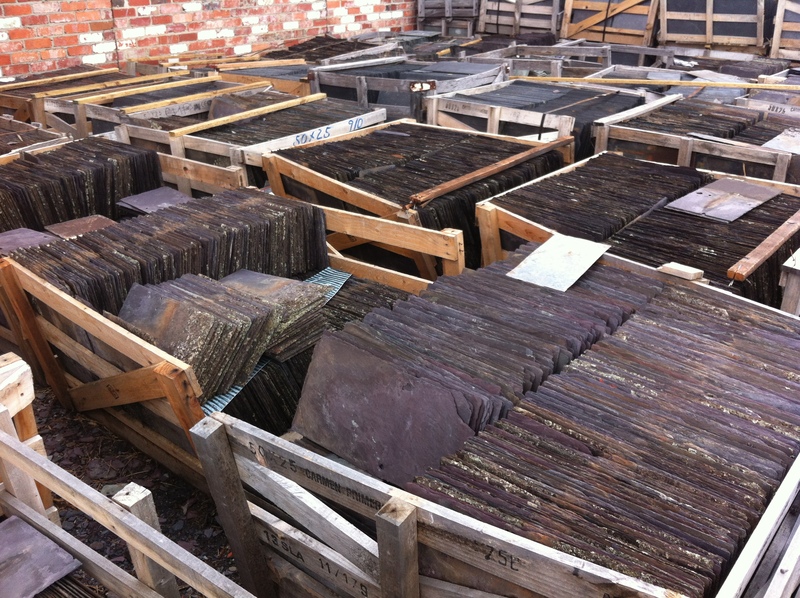 We can offer you all types of repairs for your slate roofing – cracked, broken, missing slate tiles. Ridge capping – metal and terracotta. Metal flashings, box gutters and valleys. Slate roof damage shouldn’t be taken lightly. Your roof needs immediate attention in the event of damage regardless of how bad it may or may not seem. Even if the roof appears to be not leaking, it can suddenly let go and become a real problem during a heavy Melbourne rainstorm. Slate is an extremely durable material, but that doesn’t mean it’s completely impervious to damage or normal wear and tear. Leakage due to unseen and unnoticed damage is one of the most common problems that we see with slate roofing around Melbourne. Surprisingly most homeowners don’t even realize anything is wrong up on their roof. An annual roof inspection will go a long way in helping you keep your roof in tip top condition and prevent any watery surprises that seem to happen when it really seems to be the most inconvenient time. 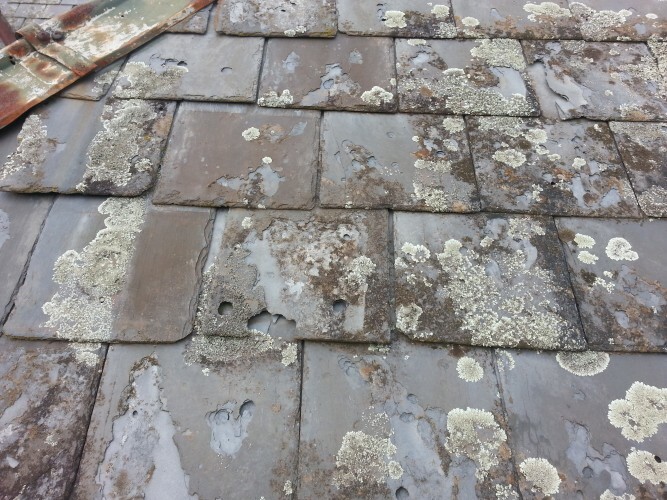 Here are six specific kinds of damaged slate roofing that we come across often and need immediate attention and repair. Hail damage: Unless you know for sure that the slates on your roof are hard and of a good quality, you can never be sure that a hail storm hasn’t caused any damage. 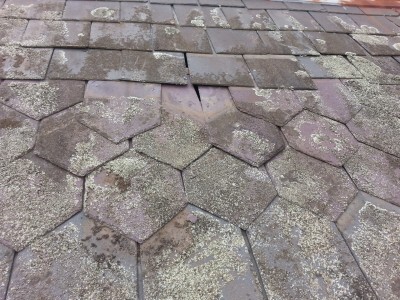 Hailstorms can chip away at a slate roof and create serious problems over time. The problems may not show at first but eventually because the slates have been weakened they soon leak. Wind damage: Slate roofing tiles aren’t very heavy when compared to concrete or terracotta roofing tiles. If the nails that hold them in position are starting to wear out it doesn’t take much for a strong wind to jiggle and rattle them until they finally come loose and slip down into the spout or worse are blown from the roof. Either scenario obviously creates problems that you’d wished you had avoided. Problems like leaking through the gap where the slate is now missing and most likely internal damage to plaster and paint. The other potentially more dangerous problem is that the slate tiles become sharp airborne missiles. These missiles can and do, break windows, damage cars parked in driveways and also have the potential to hit and injure people. Rusting : Many homeowners are surprised to find that rusting metal flashings is the reason for internal damage from their slate roof. The issue here isn’t exactly the slate itself; it’s the metal valleys, box guttering and chimney trays installed between and supporting the slating. The slate won’t likely need to be replaced due to rust issues, but the metalwork will definitely need to be replaced and the slates reinstalled over them. This is a problem that if left without replacing, progressively and rapidly gets much worse. Trees, limbs and branches: Another problem that we often see any time of the year but more commonly after storms and strong winds. Keep trees cut back far enough so that they don’t hang directly over your home if possible. A fallen tree can do much more damage than destroy your slate roof; they can – if big enough – cause substantial damage to large areas of your home. Falling or flying objects: As with wind damage causing slates to slip or fly from the roof, strong winds can also dislodge ridge capping… both metal and terracotta. Many homeowners deal with roofing, siding, and window damage after a major storm. Give us a call for a roof inspection if you’re worried about storm damage. Normal wear and tear of roofing slate : Melbourne weather in general carry’s issues that affect your roof on a daily basis. Blistering heat in the middle of summer to freeze thaw cycles in the middle of winter. You can bet that every part of your home is taking on some type of damage every single day, however not all of the damage needs to be addressed at the end of each day. As homeowners, we deal with all of those small things once a year or so, depending on what’s gone wrong. 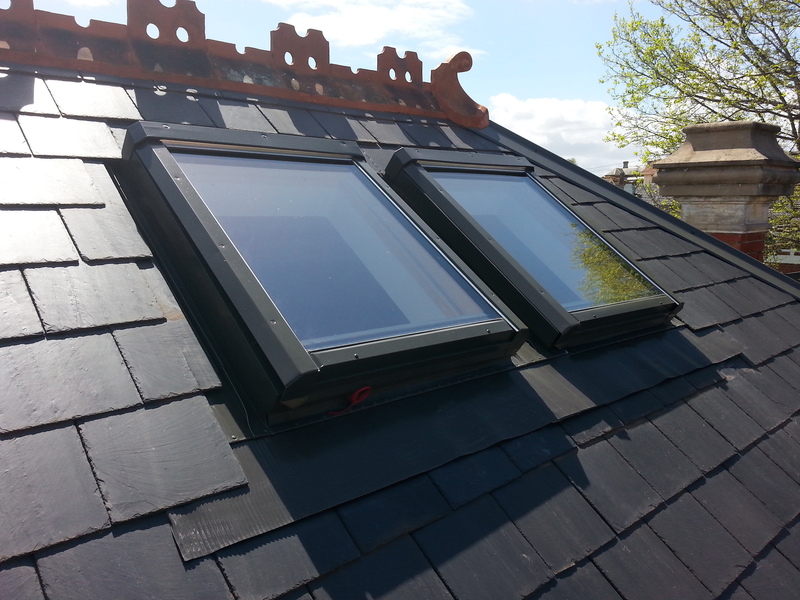 That’s why we offer slate roof maintenance programs to suit your particular needs. After an initial inspection we can probably advise you of a suitable time interval to have your roof checked. Some really need annual checks while other can go for periods of five years or more. So there you have it; damaged slate roofing in Melbourne can be caused by any number of different reasons. The important thing to remember to probably prevent more eventual internal damage is to be proactive rather than reactive in most cases. Regular inspections and maintenance can also help eliminate or reduce costly damage when those freaky Melbourne storms hit. Here at Melbourne Slate Roof Repairs, we do it all. 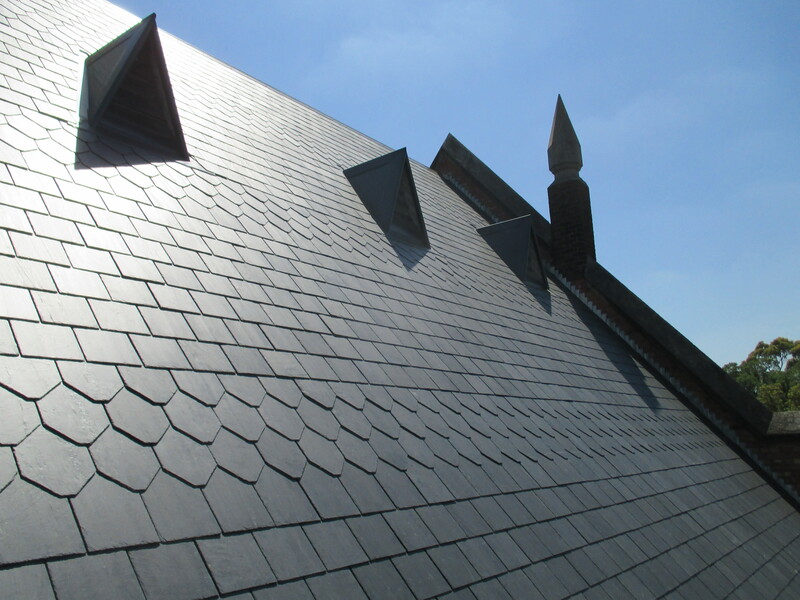 We repair all problems related to damaged slate roofing. We will find every leak and create a solution to stop it. We will replace slipped, broken, cracked, or damaged slates. We will repair rusted valleys, box gutters, and chimney flashings that are in the way of the damaged slate. Every area of your roof can leak – our job is to make sure it doesn’t. Call us at 0403 022 137 to schedule an appointment for a consultation if your slate roof is in need of repair or replacement.